One of the best deals in town! 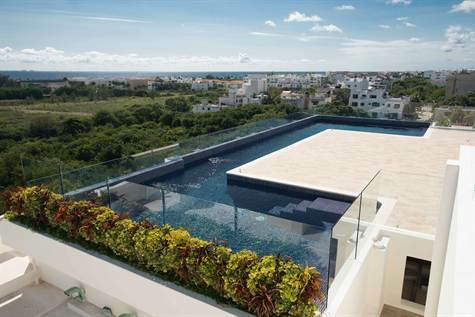 Built by one of Playa del Carmen’s best development companies, this unit is located in a prime Playa del Carmen real estate area known as the new 5th. Hence the name this area is actually being built up very quickly and will soon be in the ranks as regular and just as popular as the rest of 5th avenue. Boasting 1,250 square feet plus a 200 sqft balcony, this 2 bedroom 2 bathroom unit is a must see. This well appointed unit is just a quick walk to the beach in the best area to build equity in the future. 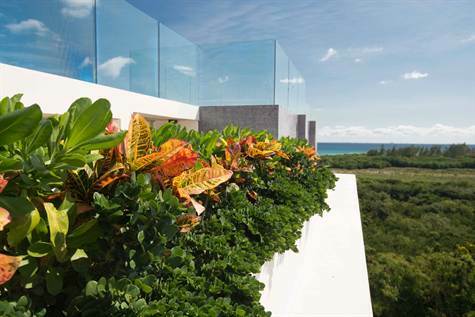 As mentioned these new condos for sale in Playa del Carmen were built by a one of the best, popular and reputable development companies known making their units spacious and with high quality construction and finishing. There are so many spectacular details to be seen and after I showed it yesterday, I would say this could be considered one of the best deals in town at $343,000 USD!!! This particular unit is located one floor down from the penthouse, (so no rooftop) but still a spectacular unit worthy of your consideration. Don’t be afraid to ask for a cash discount if this is a possibility. Click here to see more photos of the unit and please note that this unit will be delivered to you UNFURNISHED. Contact me for more info, I can’t wait to show you everything this unit has to offer. Playa del Carmen Condo For Sale – 1 Minute Walk to Beach! 1 Br Condo at Mamita’s Beach Presents Great Rental Opportunities! 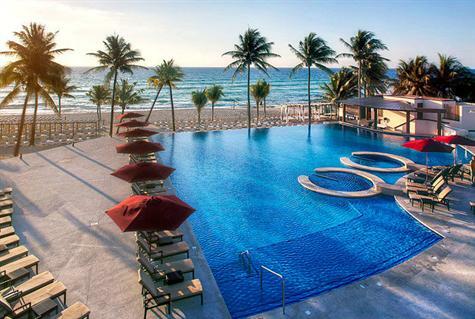 Lucrative Investment Near Mamitas Beach in Playa del Carmen! Playa del Carmen real estate was made for this type of opportunity! In the heart of Playa del Cramen’s central nightlife you have Mamita’s Beach Club. This unit is right in the middle of it. It’s a 1 bedroom 2 bathroom unit and presents excellent rental income if that’s the type of investment you are looking for! The unit measures a generous 950 square feet and comes to you fully furnished and ready to go right from the start. Start making money the day after you purchase! Click on the pic above to go directly to the listing. You can find more info about Playa del Carmen Real Estate on our website and please don’t forget to visit us on Facebook, Point2 and Youtube. Includes pool and so much living space! Want more space to live? Like to spread out or have a large family? Then you simply must discover this 1300 square foot condo for sale just a short 5 km north of the center of Playa del Carmen. Discover ‘El Cielo’, a gated development with a less expensive price tag than what you might find in the town of Playa del Carmen. This area is rapidly becoming popular with the immense growth of the area in just the last few years. Get in now before the prices sky rocket! This 2 bedroom, 2 bathroom is located close to Xcalacoco beach, one of the best in the area. It comes to you fully equipped with appliances including a dishwasher, air conditioning, wood closets and doors, and each condo has its own balcony/terrace. The design is smart and perfect for modern lifestyle at an affordable price. You just can’t lose! All together there are 17 condos with a common area of beautiful landscaping, bicycle trails a swimming pool perfect for family and your guests. Click on the photo above to see more pictures and find out more information. This is growing Playa del Carmen real estate at its finest! Visit us on our website and please don’t forget to check us out on Facebook, Point2 and Youtube. The Best Deal Available in Playa del Carmen Real Estate! Live in Luxury for Less! Have you ever dreamed of owning a home abroad but thought you would never be able to afford it? With this great Playa del Carmen real estate deal, this is your chance to live in the Caribbean for less than a $100,000 for your vacation or retirement home. This ground floor unit is close to the beach, located in the gated community of Playacar in Playa del Carmen, Mexico, between resorts, golf courses and the amazing Caribbean waters. Enjoy 2 bedrooms and 2 bathrooms in this bargain home which comes to you semi furnished. Just click on the picture to go directly to the listing that includes all the info you need on this one of a kind bargain real estate deal. Want more great deals like this? You can find more info about Playa del Carmen Real Estate on our website and please don’t forget to visit us on Facebook, Point2 and Youtube.